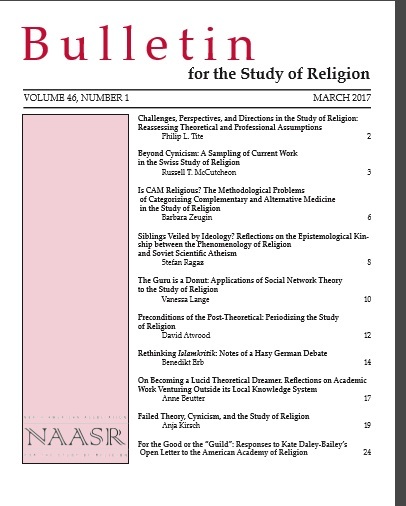 The following is the introduction to the March 2017 issue of the Bulletin for the Study of Religion (the full table of contents having already been posted). Although our publisher has kindly made this introduction freely available, we offer this editorial here on the blog in order to give readers an overview of the most recent issue of the Bulletin. In one capacity or another, I have been part of the academic study of religion for just under thirty years. Although I considered switching to other fields or disciplines of study, especially while a student, I always found religious studies my “home.” There has always been an energy to our field, an ongoing clash of ideas and theoretical perspectives, and also professional challenges. It is this very energy that has made the study of religion such a fun place to be, yet also a frustrating field to work in. This issue of the Bulletin brings together two sets of articles that challenge readers to look forward, to broaden their horizons, and to reassess their assumptions about the field both theoretically and professionally. Our first set of articles comes from the European context. Russell McCutcheon, who is finishing off his term as our current NAASR president, was visiting with a group of early career scholars (at the doctoral or post-doctoral level) who are working on a range of projects engaging theory in the study of religion. We felt it would be helpful for Bulletin readers to get a glimpse into some of the exciting work being done in the Swiss context. We are pleased, therefore, to include a set of short presentations of such research. For myself, it is my hope that such a glimpse will encourage even greater international collaboration on theorizing religion. Setting the stage for these articles, McCutcheon offers a fascinating glimpse into the role of theory in our field, especially in how the reception of theory has shifted over the past few decades. Closing off this set of articles, Anja Kirsch (who is overseeing much of the research presented in this issue) offers a challenging afterword, raising for consideration our relation to theory, the role of theory in the identity and history of a discipline, while engaging the insights of the particular European context(s) addressed in this wonderful set of articles. Our second set of articles shifts focus to a series of responses to Kate Daley-Bailey’s Open Letter to the AAR on contingent faculty (2015). This letter was published in the Bulletin just over a year ago, and it ignited a much-needed conversation on the challenges facing contingent and adjunct faculty and how our professional associations can do a better job at responding to the increasing shifts in our profession (where approximately 70 percent to 80 percent of undergraduate teaching in the humanities and social sciences—including, of course, religious studies—is now done by underemployed or contractually employed faculty in North America). Daley-Bailey elucidated ways in which the AAR annual meeting systemically marginalizes such scholars, despite attempts by the AAR to respond to their member needs. I feel that she is calling for a paradigm shift in the profession, in this our largest academic association, to meet shifting trends in demographics of those increasingly comprising the “new career norm” in religious studies. We are pleased to begin with a response from Jack Fitzmier, executive director of the American Academy of Religion, followed by responses from Charles McCrary, Kerry Danner, Jason Sager, and Helen Ramirez. Daley-Bailey offers a rejoinder to this set of articles. It is our hope that this set of reactions to the Open Letter will spark a productive, ongoing conversation on a transforming academic profession. The articles published in this issue of the Bulletin are meant to create conversation, perhaps even heated debates. These articles challenge readers to see the study of religion—be that as a profession or as theory-building—from fresh perspectives, both geographically and socio-economically. We want readers to read against the grain and to be pushed out of their comfort zones. The horizons facing our field of study are global, disruptive, yet forward-moving. We welcome readers to join these discussions either through our very active blog or in the pages of the Bulletin itself; to reflect, respond, and engage the ideas presented by our authors. Daley-Bailey, Kate. 2015. “For the Good or the ‘Guild’: An Open Letter to the American Academy of Religion.” Bulletin for the Study of Religion 44(4): 4–11. https:// doi.org/10.1558/bsor.v44i4.29036. This entry was posted in Academy, Announcements, Editorial, Kate Daley-Bailey, Pedagogy, Philip L. Tite, Politics and Religion, Religion and Society, Religion and Theory, Theory and Method, Uncategorized and tagged AAR, adjunctification, Adjuncts, American Academy of Religion, Anja Kirsch, Anne Beutter, Barbara Zeugin, Benedikt Erb, Bulletin for the Study of Religion, Charles McCrary, contingent faculty, David Atwood, Europe, Germany, Helen Ramirez, Jack Fitzmier, Jason Sager, Kerry Danner, NAASR, network theory, North American Association for the Study of Religion, Open Letter, Philip L. Tite, Religion, religious studies, Russell McCutcheon, scholarship, Stefan Ragaz, Switzerland, Vanessa Lange. Bookmark the permalink.